The Center for Women in Law held their annual Power Lunch Series every Tuesday throughout the month of October. “CWIL, through the Power Lunch Series, provides students with role models and mentors by exposing them to prominent lawyers and other public figures. Attending students have the opportunity to ask questions and discuss their own career goals in an intimate and interactive environment,” explained Executive Director Linda Bray Chanow. This year’s speakers included Juanita Harris, the Assistant Vice President and Senior Legal Counsel to Human Resources for AT&T, Denise Davis, partner at Davis Kaufman PLLC, Mandy Price, co-founder and CEO of Kanarys, Inc., Karen Popp, partner and global co-chair at White Collar & Compliance Group at Sidley Austin LLP, and Judge Elsa Alcala, a judge on the Court of Criminal Appeals. On October 2, Juanita Harris, the Assistant Vice President and Senior Legal Counsel to Human Resources at AT&T, spoke to students on what it’s like to be a lawyer for a globally recognized company. She is a veteran corporate attorney whose expert advice and counsel on employment matters helps drive business growth for AT&T. On October 9, Denise Davis, partner at Davis Kaufman, spoke to students on working in both public and private practice. She advised them to delve in public service, even if they work in the private sector. She also emphasized the importance of building relationships, both professionally and personally. On October 16, Mandy Price, the co-founder and CEO of Kanarys, Inc., spoke to students about her journey from corporate lawyer to CEO of a start-up. In April 2018, she co-founded Kanarys, Inc., a new technology company that is addressing diversity and inclusion issues in the workplace. Prior to Kanarys, Ms. Price was a corporate partner in the Dallas office of Barnes & Thornburg LLP, where she was named one of the 20 “Winning Women” lawyers in Texas. She spoke to students on the importance of being intentional with every decision you take. She also emphasized the importance of learning how to navigate the environment and culture of the workplace. On October 23, Karen Popp, partner and global co-chair at White Collar & Compliance Group at Sidley Austin LLP, spoke to students about her expansive practice representing companies and individuals in allegations of criminal, civil and ethical wrongdoing. She shared her experience integrating legal, political and public relation components to advance her career. Ms. Popp represents Sidley clients across a host of industries in a wide range of matters. Her practice is informed by a wealth of government and private sector experience, including service as a federal prosecutor in New York, a lawyer in the Office of Legal Counsel at the U.S. Department of Justice, and Associate White House Counsel to President Clinton. And finally, on October 30, Judge Elsa Alcala spoke to students about her path to the Court of Criminal Appeals. She was appointed in May 2011 by Governor Rick Perry. During her talk, she emphasized the importance of confidence and determination. Prior to becoming a judge on the Court of Criminal Appeals, she served for nine years as a justice on the First Court of Appeals and judge of the 338th District Court for over three years. Before becoming a judge, Judge Alcala was an assistant district attorney for nine years, serving under District Attorney Johnny Holmes at the Harris County District Attorney’s Office. 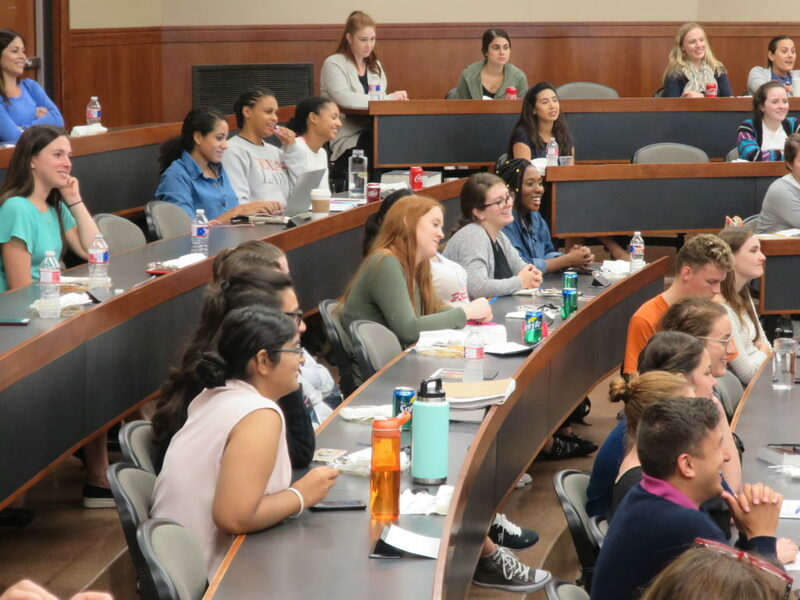 “We are appreciative of the amazing women lawyers who gave their time and shared their wisdom with Texas Law students,” said Amber Crosby, Deputy Director at CWIL. Join CWIL for their next Power Lunch Series in October 2019. The Power Lunch Series is made possible by the Hortense S. Ward Speaker Fund. The Center for Women in Law is the premier educational institution devoted to the success of the entire spectrum of women in law, from first-year law students to the most experienced and accomplished attorneys. It combines theory with practice, identifying and addressing the persistent issues facing individual women and the profession as a whole. If you would like more information, please call the Center for Women in Law at 512-232-5166 or visit http://centerforwomeninlaw.org.